Aham denotes the word "I". Brahman is the supreme reality of existence. Asmi equals to "am". Hence the meaning of this Mahavakya is I am Brahman. The word Brahman has more than one meaning. One meaning indicates a person belongs to the caste of the Brahmin community. Another meaning of the word Brahman indicates the deity of creation who is one of the three deities of creation, sustenance, and dissolution of the universe. Yet another meaning of the word connotes the ultimate reality of existence. That from whence these beings are born, that by which, when born, they live, that into which they enter at their death, try to know that; That is Brahman. It is better understood as 'I am the ultimate reality of the existence'. It should be understood as a statement of experience. The statement has come out from experience and it should be realized only through experience, not by lecture, explanation or guidance. This self was indeed Brahman in the beginning. It knew itself only as "I am Brahman." Therefore it became all. And whoever among the gods had this enlightenment, also became That Brahman. It is the same with the seers (rishis), the same with men. The seer Vamadeva, having realized this self as That, came to know: "I was Manu and the sun." And to this day, whoever in a like manner knows the self as "I am Brahman," becomes all this universe. Even the gods cannot prevent his becoming this, for he has become their Self. -The translation of Adi Sankara's Commentary by Madhavananda. Advaita means non-duality. It is one of the philosophies of Vedanta which describes the oneness of the reality of the existence: Brahman that is eternal, formless and beyond delusion. According to Advaita philosophy, only Brahman is real, the world is a delusion. Atman is Brahman only. This is the core concept of Advaita Vedanta. Anena Vedyam Sacchatstram iti Vedanta dindimah." "Brahman is real. The world is a delusion. Atman is nothing but Brahman. It is the perfect philosophy as declared by the Vedanta." -Brahma Jnanavali Mala, Adi Sankara. The first line of this verse is the quote from Niralamba Upanishad. Rig Veda declares Ekam Sat, Truth is one. They called him Indra, Mitra, Varuna, Agni and he is the heavenly bird of beautiful wings. The truth is one. The sages call it by many names and describe it in many ways, hence they call it Agni, Yama and Matraisvan. Paramarthika Satta - the plane of absolute existence or transcendental existence. Vyavaharika Satta - the plane of worldly existence. Pratibhasika Satta - the plane of illusory existence. Except for the plane of transcendental existence, the other two planes are the outcomes of Maya or delusion. If ignorance or avidya is cleared, these two planes of existence cease to exist and the absolute existence prevails. I am the body, I am the mind, or I am Atman (except when the oneness of Atman is realized) are the functions of delusion. I am the pure consciousness or I am indeed Brahman is the reality. The conceptual understanding that I am Brahman does not serve the purpose. The realization happens only in the complete absence of Maya. That is why it is often reminded not to be understood as Upadesa Vakya. The techniques like "Who am I?" and "Neti, Neti" (not this, not this) are misunderstood as the techniques of reasoning. Surely they are the techniques of realization. The seeker should meditate and realize by rejecting as " I am not this, I am not this". When the snares of Maya have been cut-off completely, he realizes the oneness of reality. Inference and testimony could not lead to the plane of transcendence or absolute reality, because they are in the lower planes. In Vivekachudamani, Adi Sankara provides the steps for realization. By merely repeating the words "I am the emperor", one cannot become an emperor. To become an emperor, the enemies should be destroyed. Likewise by merely repeating the words "I am Brahman", the oneness of Brahman is not realized. He should destroy the illusion and avidya by discriminating the real and unreal. The first step is the complete detachment from impermanent things. Then one should follow calmness, self-control, perseverance, and renunciation of selfish activities. Then he should learn and follow what he has studied. As the last step, he should go for a long-lasting constant meditation on truth. In this very life, he will realize. Like three levels of existence, Vedanta postulates three states of existence. Jagrat, Svapna, and Susupti. They are the states of waking, dreaming and deep-sleep respectively. Yet another state is Turiya meaning the fourth one. The fourth one is not a state beyond the three states. The experiences of the other states are reflected there. The experiences like I have had good sleep, It was a bad dream and the like, are happening in that state. Hence it is the sub-stratum of the three states and is present in all three states. It is the witness part. It is the subjective reality. It is the state of pure consciousness. The pure consciousness is Atman. Hence Self has four aspects. Vaisvanara, Taijasa, Prajna, and Turya. Vaisvanara is the experiencer of gross objects. Taijasa is the experiencer of subtle objects. Prajna is the experiencer of causal objects. Turya is the absolute experiencer, the Supreme Atman. In Advaita, Aham Brahmasmi is Jiva-Brahma-Ikya-Anubhava. Simply put, it is the experience of the oneness of Atman and Brahman. Vishishtadvaita means qualified Advaita. Brahman is one. Souls are many and equal. God and souls are inseparable. On liberation, the soul realizes God and does not become God. Sri Ramanuja propounded this philosophy. He declares Brahman is Lord Vishnu. Sri Ramanuja does not comment upon this Mahavakya. In Dvaita, God is different from Atman. Worship is the medium to attain salvation. God is one and He is Vishnu. Souls are many and are not equal. When liberated, Atman gets some qualities of God, but still inferior. Sri Madhvacharya propagated Dvaita. Dvaita is basically Vaishnavism that accepts only Lord Vishnu as God. The interpretation of this Mahavakya by Madhvacharya in his commentary on verse 1.4.10 of Brihadaranyaka Upanishad is as below. 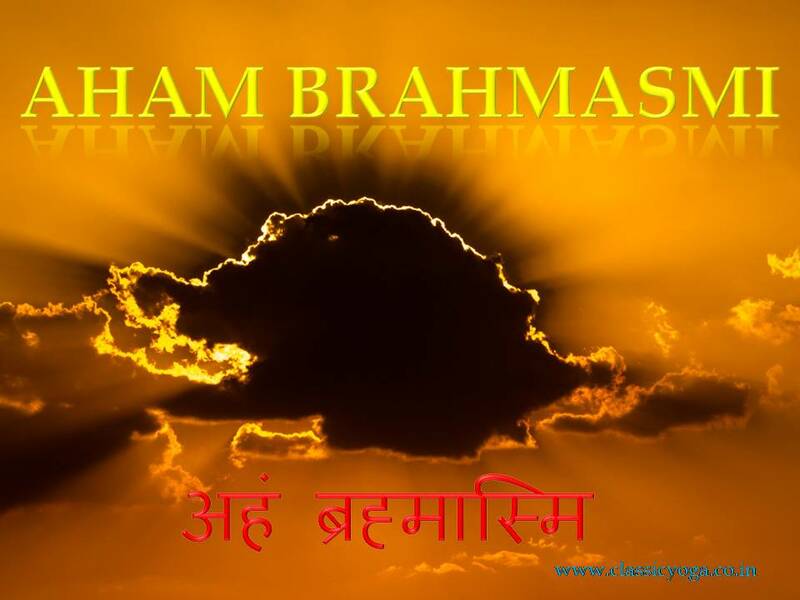 "The word Aham in the sentence 'Aham Brahma Asmi' does not mean "I", and the sentence above given does not mean "I am Brahman". On the other hand, Aham means Aheyam "that which cannot be neglected, cannot be avoided"; similarly the word Brahma means "all-full". Asmi does not mean "I am" but it is a compound of two words "As" meaning existence and "Mi" meaning knowable. So Asmi means ever-existing knowledge or him whose knowledge is ever-existing and never-obscured. Brahman knew (always realizes) the nature of His self as being Aheyam (all-pervading ruler of the world), Brahma (all-full), and Asmi (ever-existing knowledge)." Chapter 28 of Ribhu Gita gives a detailed explanation to the four Mahavakyas. Ribhu Gita states that the word Aham denotes Atman, Brahman indicates God and the endless identity between the two is Asmi. The intellectual inquiry of this Mahavakya and the experience that results from that inquiry gives the state of the realization of the proclamation. He who makes the inquiry with the firm conviction of 'I am Brahman' surely destroy the distortions of the mind forever. Having established the meaning of the statement of oneness in the mind without any contradiction, one casts of all the impressions and experiences of the past. The third chapter of Tejo Bindu Upanishad gives a technique of meditation of 'I am indeed Brahman'. It also describes the benefits of chanting 'I am Brahman' as a mantra. This mantra alone is enough, says the Upanishad, to attain liberation. Mundaka Upanishad 3.2.9 declares, "Brahmavid Brahmaiva Bhavati". The knower of Brahman becomes Brahman himself. Hence the knower of Brahman knows "Aham Brahmasmi".